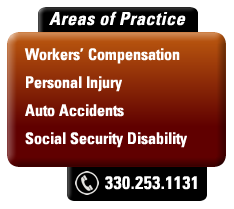 One of my jobs as an Ohio workers compensation attorney is to monitor my clients’ claims for additional conditions. Most Ohio workers compensation claims involve state fund employers in which the Ohio Bureau of Workers Compensation(BWC) pays for medical treatments and makes compensation payments to the injured worker. The claim is initially allowed for certain conditions by the BWC or by the Industrial Commission at a hearing. Thereafter, the treating doctor may diagnose additional injuries/conditions which that physician wants to treat in the claim. Since the BWC only pays for the allowed conditions in the claim, any new diagnosed conditions must be added to the claim. This may be done by the physician of record submitting a form C-9 request to the BWC for including the new condition(s), by the doctor’s office having the patient sign a Motion for additional allowance of the claim which is filed with the BWC, or by the injured worker’s attorney filing a Motion for Additional Allowance of Conditions with the BWC. The first two methods, which are usually done without the attorney’s knowledge or consent, are often filled with legal pitfalls. The exception is where the additionally requested condition is so obviously related to the original work related injury that the BWC will probably not question the additional allowance. For example, if the injured worker fell off a roof at work and the BWC initially allowed the claim for a right leg fracture; and the hospital records also showed injury to the right wrist which follow-up x-rays revealed to be a fractured wrist, the evidence is strong that this condition is related to the fall and should be additionally allowed. However, treating doctors may later diagnose a condition which does not involve an injured body part listed on the claim application(First Report of Injury) or may involve conditions which may or may not be related to trauma(ie. bulging/protruded disc(s) or tendonitis/tendinosis or impingement syndrome of the shoulder). Unless the requested condition is so obviously related to the injury, the BWC is going to obtain a medical review report from its doctor. Often these conservative doctors find that there is “insufficient medical evidence” of a causal relationship between the original injury/allowed conditions. In such case the request for additional allowance is referred by the BWC to the Industrial Commision for a hearing. The hearing officer will require that the injured worker meet his/her burden of establishing a direct and proximate causal relationship as well as weigh the probative legal/medical evidence. If the additional condition(s) are disallowed by the Industrial Commission then the requested conditions are permanently disallowed in the claim unless the injured worker timely files an appeal into the Court of Common Pleas and obtains a favorable jury verdict several years later, and, after spending thousands of dollars on litigation expenses. If the request for additional allowance comes either from the doctor’s office or by our client and the BWC refers the matter for an Industrial Commission hearing, I, as the injured worker’s attorney must decide whether or not we can gather sufficient evidence to pursue the additional allowance at a hearing. If not, I will advise our client and the doctor that we are withdrawing the request for additional allowance and having the hearing cancelled. After all, as an experienced workers compensation trial lawyer I can evaluate the sufficiency of medical evidence and the legal arguments and testimony required for a favorable decision. Doctors do not understand the complexities of the workers compensation laws, rules and policies. They are not use to be questioned by anyone on their decisions. Obviously, the best method is for the attorney to file a Motion for Additional Allowance(s) only when the attorney has obtained the best and strongest evidence to support filing a motion. In some cases a potential client will contact us when he/she receives a hearing referral letter from the BWC or receives a Notice of Hearing. In such case, we will need to immediately review the workers compensation claim and all of the documents before deciding whether we can build the case to follow through with a hearing. An injured worker should never attend such a hearing by themselves since it will be that much more difficult and potentially expensive for an attorney to later try to turn the disallowance around, particularly if the disallowance has to be filed into Court.